Two-point boundary value problems appear frequently in space trajectory design. A remarkable example is represented by the Lambert’s problem, where the conic arc linking two fixed positions in space in a given time is to be characterized in the frame of the two-body problem. Classical methods to numerically solve these problems rely on iterative procedures, which turn out to be computationally intensive in case of lack of good first guesses for the solution. An algorithm to obtain the high order expansion of the solution of a two-point boundary value problem is presented in this paper. The classical iterative procedures are applied to identify a reference solution. Then, differential algebra is used to expand the solution of the problem around the achieved one. Consequently, the computation of new solutions in a relatively large neighborhood of the reference one is reduced to the simple evaluation of polynomials. 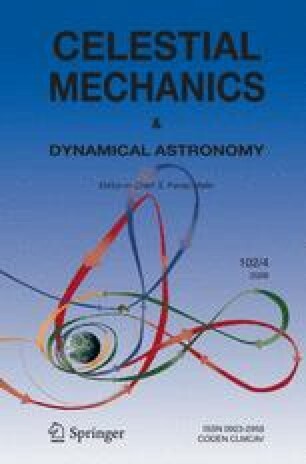 The performances of the method are assessed by addressing typical applications in the field of spacecraft dynamics, such as the identification of halo orbits and the design of aerocapture maneuvers.